Maureen Torrey, an 11th-generation farmer in the rural town of Elba, N.Y., has been losing sleep. Just as rows of cabbage and winter squash stand ready for harvest on her 11,000 acre farm, she can’t find enough workers to bring in the crops. She needs about 350 workers and is 70 short of that number. “I wake up at 3:30 in the morning and my mind doesn’t shut off,” she says. The problem, she says, is fear. Torrey Farms, a 14-crop vegetable farm located an hour east of Buffalo, has been raided twice since last October, when she says immigration officials kicked in the doors of workers’ housing and apprehended 34. In August, officials arrested seven workers and 14 more fled the area. Amid continued talk of a federal crackdown on undocumented immigrants, she’s afraid still more of her workforce will flee to less hostile terrain. With a population of about 9,000, the town of Elba, “Onion Capital of the World” to locals, may not have the manpower to replace them. A climate of fear is spreading among undocumented immigrant workers, causing turmoil in industries dependent on their labor. In August the Homeland Security Dept. announced that employers would be required to terminate workers who fail to produce valid Social Security numbers. Implementation of the new rule is delayed pending the outcome of a lawsuit brought against the government by the umbrella labor union group, the AFL-CIO. But while the new rule has yet to take effect, its impact is already being felt by farmers like Torrey. An estimated three-quarters of agricultural workers in the U.S. are undocumented, and growers are starting to feel the paralyzing effects of losing their workforce. They say that unless the government implements workable reforms, the future of the U.S. as a food-producing nation is in jeopardy. Agriculture does not play the role it once did in the U.S. economy, of course. Though the amount of farmland used has remained fairly steady over the past century, changes to the structure of farms and improvements in productivity have cut the number of people involved dramatically. In 1900, for example, 41% of the U.S. population was employed in agriculture, while that number now stands at less than 2%. Farmers hire workers for about 3 million agricultural jobs each year, but only one-quarter of that workforce is legally authorized. Agriculture also makes up a lower share of the U.S. gross domestic product than ever, accounting for less than 1%. Still, farm advocates say that immigrant workers are allowing U.S. farmers to compete in a fierce global marketplace, and that losing the workforce means losing domestic sources of food. “The choice is simple: Do we want to import workers or import food?” says Craig Regelbrugge, co-chair of the Agriculture Coalition for Immigration Reform. While some employers of immigrants fear the limelight, the 55-year-old Torrey is unabashedly vocal in her opposition to the government’s proposed crackdown. She set up the Web site http://www.saveUSFarms.org, which allows farmers to sign a petition and make donations in support of the AgJobs bill (S. 1645/ H.R. 3142). She also testified before Congress on the issue. The bill, currently being debated in Congress, would streamline the H-2A farm worker visa program and also allow workers a path to permanent resident status. Many agriculture experts agree. On Oct. 4, farmers and economists testified in front of the U.S. House of Representatives’ Agriculture Committee to plead their case for reform. “The U.S. agricultural industry is in the midst of a labor crisis, the resolution of which will determine whether U.S. producers…are more than marginal participants in U.S. and global markets,” said Holt in his testimony in support of AgJobs. While AgJobs is debated, some growers are advocating more employer-friendly regulations. The Bush administration is currently rewriting federal regulations, to accommodate employers’ needs, that forgo the promise of permanent residency for agricultural workers. The Homeland Security Dept., State Dept., and Labor Dept. are involved in that effort, which was announced alongside the call in August to crack down on workers with suspect Social Security numbers. It is unclear how much progress Congress can make on immigration reform before it lets out for the year in mid-November. As farmers like Torrey are pushing for AgJobs, other employer groups disappointed by the failure of comprehensive immigration reform in June are stepping up efforts to pass narrower reforms. For example technology companies including IBM, Microsoft, Google, and Oracle, are pushing for more visas for skilled workers, while tourism and hotel groups advocate for more non-farm, unskilled visas. One question in the background of the debate is why employers do not raise wages to avoid legal problems and attract a native-born workforce. But unlike other industries that might attract more workers with greater pay — such as nursing and segments of the technology industry — it is not clear that raising wages for agricultural work would attract Americans to these jobs. Between 1990 and 2006, wages in agriculture have increased 54%, from an average of $6.12 per hour to $9.44 per hour (both figures are in 2006 dollars). Yet shortages remain common. COMMENT: So, send them back and make the farmers pay real wages to American workers or make some kind of accommodation to help the farmers? What in the world is the US all in a lather for over illegal immigration. Down under, we would be united as one voice in treating the criminals as criminals. I am really beginning to wonder about your future “up there.” Where did your nation’s ideals and values disappear to? 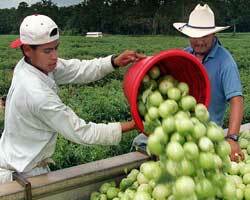 There IS a legal and successful solution to hiring seasonal foreign workers. The H2B visa is the solution. Michigan Congressman Bart Stupak is sponsoring a Permanent H2B visa. The yearly extension method does not worker. This visa is NOT an immigration issue; it is a small business issue! Check out savesmallbusiness.org for more information. Its President, Hank Lavery mentions that seeking approval of the current H2B visa after Washington returns from the Holiday break is ongoing and VITAL! Small business DOES support big business. Immigration “reform” should start with enforcing the laws that are already in the books!! Happy New Year to all.